I did look up a few things about the series and did have some minor stuff spoiled for me, like how Bigby and Snow White were married and had children. 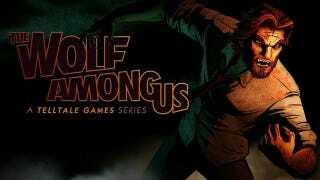 The Wolf Among Us I suppose must take place near the beginning of the series as none of that has happened yet. It's about Bigby investigating the case of a murdered Fable Town Call Girl (a Fable called Donkeyskin...?). Bigby goes around investigating and catches a suspect, only for the episode to end with the discovery of Snow White's severed head on the steps of the apartment building like the first victim. Now this is Telltale, and it's only the first part of the game (out of 5 like The Walking Dead) so they may explain it later on, but the way they kept going on in the game about how unusual and scary it is for a Fable to actually die, I can't help but wonder. I guess if it IS cannon then she must come back to life somehow, but does that happen a lot in the comics? I don't mind people coming back from the dead, I enjoy Superhero comics where it happens at least once a week after all, but I thought Fables was supposed to be different, like yeah these are fairy tale beings but there's a certain amount of realism there. If death is just a minor inconvenience I have to say I probably wouldn't enjoy it that much.